When people ask me what an Angry Whopper is, I explain to them that an onion was abused with spices and other devious measures during its formative days in the soil and is here for revenge, or at least that's what my TV tells me. What doesn't make sense about this (among many things) is that half of the onions on the Angry Whopper had no detectable spice. The jalapeños sure did though, and boy is there a lot of mayo Angry Sauce. Oftentimes in our lives, confusion makes us act out in anger. In the case of the Angry Whopper, I am just confused. Sure, it is delicious (no small feat for the vaporized grease pushers at Burger King), but I don't really feel like I "know" the Angry Whopper. I have consumed one on two separate occasions -- One with a meal, and one as an a la carte sandwich for the whopping big price of $4.02 -- and I still don't get it. Some bites of the Angry Whopper taste exactly like its well adjusted Whopper sibling, which makes sense since the receipt I was given reads 1 SC WHOPCHZ 3.89 PLUS ANGRY(!) 0.60. Others treat you with the sweet burn of jalapeños. My virgin bite of an Angry (I'll call it this for brevity's sake for here on out) tasted completely normal and I found myself wondering if I had been slipped the wrong burger or if I had developed an extremely high tolerance for spice. As I ate on, randomly placed jalapeños added some hot surprises with intensity that grew stronger as the burger diminished. Bite to bite, though, the experience is hardly consistent, which I suppose is true of anger itself. It's worth taking a look at the Angry's ingredients, in prioritized order as seen on the Burger King web site. Angry Onions: The first time I ate an Angry, I was convinced that the "spicy onions thing" was a total lie. The only angering thing about them was that they suffered from that problem you have with onion rings where you take a bite and the onion comes out, leaving a fried shell behind. During my second Angry experience, I hand-picked an Angry Onion for solo consumption. The first bite tasted like the onion ring nub it resembled, but the second bite actually had some spice. Confusing! Jalapeños: It's hard to mess these up. They're spicy and sweet with a burn that increases as you eat more of the Angry. My only complaint is that their haphazard placement leads to inconsistent heat. Pepper Jack Cheese: My friends know that I hate at least 88% of the cheese on the market. For a pure taste test, I left the cheese on and it either is completely flavorless, is pretty damn good, or is masked by all of the other "fixins." An Angry Sauce: I was convinced that my first Angry was just topped with plain old mayonnaise. So were my hands, my face and my notes. The sauce was everywhere and I wasn't even recklessly chomping. After I was told about "An Angry Sauce" (why "an"?????) I made sure to take note of it during my second spiral into anger. As far as I can tell it tastes like sweet BBQ sauce. 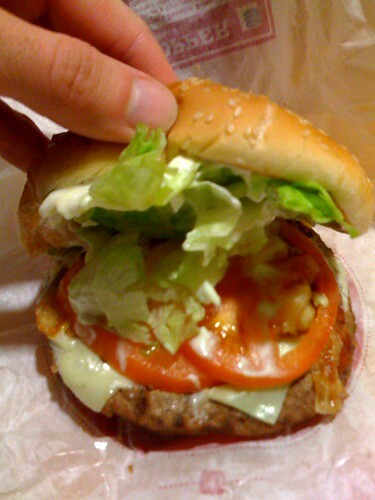 For some reason, Burger King does not highlight the fact that there is bacon on this thing. Perhaps it's because there is barely any present. When I first looked at the Angry, before eating it, I thought I saw a piece of bacon. But as I continued to eat, I was convinced that I had seen a funny-looking onion. My notes even say something like "I thought a piece of onion was a piece of bacon. Fail." Later on, I discovered a two-inch strip of bacon. There definitely needs to be better bacon coverage on the Angry. So, after we've all calmed down and had some time to think, do we care enough about the Angry Whopper to forgive its quirks? Absolutely. It's fast food, so it's imperfect but absolutely delicious. Wolf: I know a lot of you ladies are going to be attending the big dance on Friday. Be prepared. It’s important that you have clean lines around the delta region. Now, Jerri, come on up here, we’re gonna do a little demonstration. Wolf: Just drop your drawers, Jerri, and relax. Wolf: Oh…I hope I have enough wax. Coach Wolf applies the wax. Wolf: Now, there are several ways you can go when dealing with the area on either side of the bacon strip. I prefer a clean, simple line! Coach Wolf removes the waxing strips and holds them up, and the class gasps. The bell rings. Wolf: OK. That’s it for today. Have fun at the dance! Thank you, Jerri. Jerri (to Coach Wolf, referring to the waxing strips): Can I take those home? I think there's a pretty good chance that I've now ruined anyone's future Angry Whopper eating experience. I am definitely going to use the hacking site to get myself free whoppers. This review was fantastic. 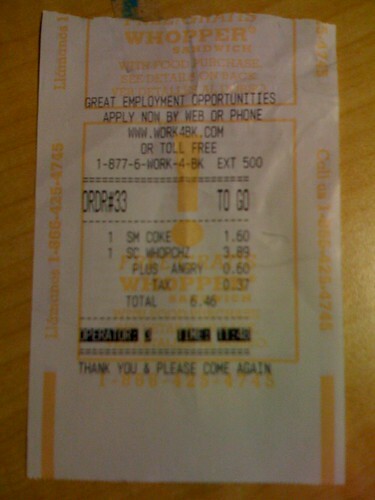 I am angry about teh angry whopperz. Well I won't pay 4 bucks for one, however I am considering shedding some dead weight on facebook for a freebie. improper jalapeno placement is an epidemic. I've yet to have a single jalapeno cheeseburger, anywhere, where instead of taking an extra four seconds to spread them around a little goddamn bit they opt to just pile them in the middle and call it good. Even down here in the so-called jalapeno promised land, there is absolutely no pride or care for flavour distribution. Scratch that: there is one place, a certain Hill-bert's Hamburgers, that cuts their jalapenos length-wise so they are well-placed and very spicy. My hats go off to them. Otherwise, the angry whopper is not alone. Such a simple step, for such a better eating experience. that first sentence was poorly constructed. I meant pretty much the opposite of what I said. Well, testicles. Second sentence. I'm sorry, I forgot to take off my retard hat this morning.